Michael Leung aka Rasty was born in Christchurch, New Zealand. A city renowned for it’s deep drum and bass culture. Now based in Osaka, Japan, together with fellow Kiwi Tim Fieldes aka Big Ted formed the Nightbirds crew with an aim to revive the Drum & Bass scene and breathe new life into the city. Since starting, Nightbirds has brought through acts such as: Commix, The Upbeats, State of Mind, Om Unit, Swindle, Jonny Dub and Chimpo, with many more plans in the pipeline. 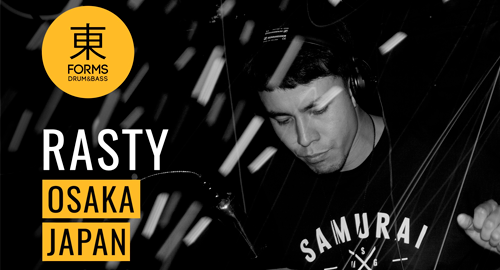 Rasty’s sound is deep and intellectual, drawing influences from the likes of Calibre, dBridge and Skeptical, but you can also hear influences of footwork, grime and hip hop through his close work with other DJs and crews within the city. When it comes to his musical philosophy Rasty believes that ‘to have a heavy sound, you don’t necessarily need to play heavy tunes. He has become an integral part of the bass music scene in Osaka, hosting and playing at a range of parties across the city, from creating platforms to showcase local DJs, to supporting international artists.